Daniel Holmes Tops National Rankings! 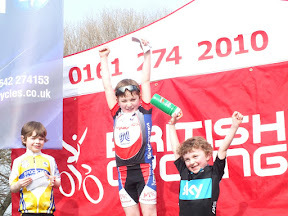 National Under 8 (E) Rankings for Road and Track published today by British Cycling show Daniel Holmes at the top with 30 points, a fantastic achievement!! And brother Sam isn't far behind in 7th place with 10 points. The girls aren't doing too badly either - Kirsty Boak lies in second place in the National Girls Under 14 (B) rankings for Road and Track, with Jess in 7th place. All these great results leave Tyneside Vagabonds in the top 50 in the country. Read more: Daniel Holmes Tops National Rankings! The final round of the Highfield Kitchens series at Prissick saw the Vagabonds youth team finish off in style with wins and podium places on the day and in the series overall. Once again Daniel Holmes and Kirsty Boak lead the way with wins in their respective categories, with both of them finishing 1st overall in the series. Jess Watts was 2nd to Kirsty in round 4, giving her 3rd place overall. Hamish Turnbull was 4th in the overall standings going into round 4, but his 4th place in the road race moved him up onto the podium in 3rd place for the series. 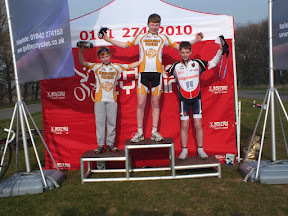 Sam Holmes was also racing, coming 3rd in the event and overall. In the 4th cat race Kyle Watts finished an impressive 3rd, gaining enough points in the process to move up to 3rd category. Well done Kyle! Full results from the racing are yet to be published. 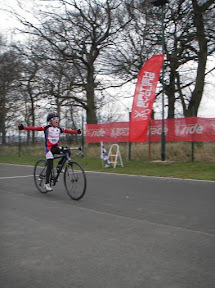 The Vagabonds Youth riders again did the club proud in the 3rd round of the Highfield Kitchens Series at Prissick on 17th March. Daniel Holmes took his third consecutive victory of the series in the Unders 8s, with younger brother Sam placing 3rd. Not to be outdone, Kirsty Boak took first place in the Girls Under 14s race, whilst Hamish Turnbull achieved his best result to date with a fine 3rd place in the Boys Under 14s. The Vagabonds are placed well in the series overall going into the final round, with all of the club's youth riders in with a chance of finishing on the podium overall. Series results to date can be found here.